Welcome to FX EA BUILDER website, which helps anyone to create Expert Advisors. As MetaTrader Programmers, we provide a fast MT4 Programming Service which allows our clients to focus on their core trading activities while we provide the Expert Advisors, indicators and scripts that are tailored to fit their specific requirements. With this Expert Advisor Builder, you will create more than simple trading systems. You will create those you need for the mt4 platform. There is no reason to wait! You should start to create your automated trading signals. 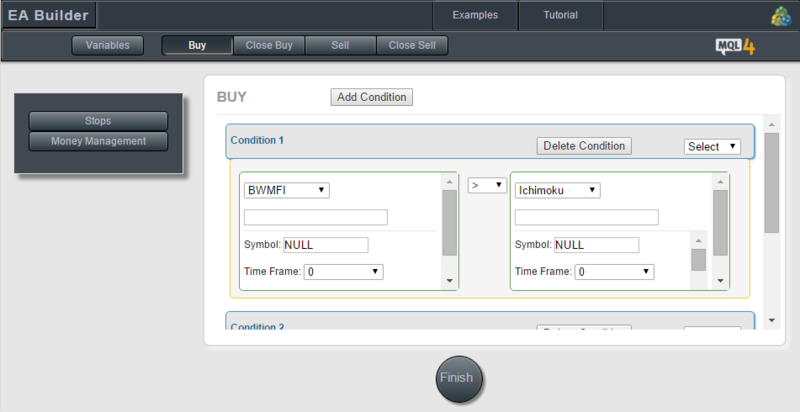 In the Trading Strategies section you will see many Expert Advisor Robots created with this EA Builder online application. Features: -	Use visual environment instead of coding process. -	You do not need any programming background. EA without programming. -	Expert Advisor with multiple currencies and multiple time frames. -	Fast development time. EA Builder saves you time. Enjoy this EA Creator! Copyright © FX EA BUILDER. All rights reserved.